At 1545 Charleston Avenue there is, by all accounts, an unassuming two-storey building that’s home to some pretty big brains. These brains form part of a very secretive organisation that goes by the name of Google[x] – with a bold remit – to invent the future. Wild rumours abound about what goes on there. It’s no surprise when the man in charge, one Astro Teller, says his team has genuinely spent time exploring the feasibility of levitation and teleportation. Whilst unfortunately that was a non-starter – Google Glass was one of Teller’s pet projects that has come to fruition. If you’re looking for ambition and innovation, Google[x] appears to have it in droves. In a recent interview with Wired magazine, Teller shared a simple mantra that guides the Google[x] Labs – 10 times rather than 10%. The thinking is if you try to do something 10% better, you tend to work from where you are. However, if you want to make something 10 times better, you need to think far harder and more laterally about what you’re going to do. He cites the idea of a car that goes 50 miles to the gallon. Achieving 10% better fuel consumption would simply be about retooling the car. But tasked with achieving 10x better performance – 500 miles to the gallon – calls for a completely different approach. So how could the 10x mantra apply to what you do? Next time you’re drawing up your marketing or campaign plan, no doubt you’ll have very specific, even aggressive targets, to achieve. Draft the plan that you think would best achieve the objectives as usual – then set it aside. Now get your team together, agency included, and collectively challenge yourselves with delivering a plan that would deliver 10x better return for the same marketing investment. Then compare the two plans. Our guess is the original may now look a little underwhelming. And while 10x better may be a big ask, it will hopefully challenge your preconceptions and make you think a whole lot bigger. Who knows, you may even end up with a plan that delivers way beyond expectations. Because as Einstein once said, the definition of insanity is doing the same thing over and over and expecting different results. Here’s to B2B(x). Thinking 10x bigger and better. It was way back in 1546 when English writer John Heywood conceived the oft-quoted proverb, ‘You cannot see the wood for the trees’. Back then he probably didn’t realise that his evergreen phrase would encapsulate so perfectly the difficult transition from CMO to CEO. Traditionally, the role of the CMO hasn’t required as broad a world view as the CEO. CEOs need to be able to distil complex information from the different strands of the business into a single vision and lead their entire team into sharing that vision too. So if the end goal is to become CEO of the organisation, the CMO must be able to seamlessly switch their role from a microcosmic to a macrocosmic level. Making that single letter change requires a detailed understanding of each arm of the business and an ability to make decisions which ultimately keep the organisation’s P&L sheet looking pretty. Solution: The CMO needs to gain exposure working in collaboration with other teams on specific initiatives and projects outside the marketing function. It’s imperative to remember however that not all roles will augment the competencies needed to become a CEO. Experience for experience’s sake won’t necessarily cut the mustard, but taking the lead on complex global projects can summon the challenge that is often associated with the upper echelons of decision-making. As David Cooperstein, VP at Forrester Research asserts,“CMOs need to invest their time in understanding the other departments they interact with and act like a company wide leader. People who are too focused on the effort to market and point their energy on new logos and campaigns are not the long term CMOs that CEOs need today”. Sticking point 2: Question marks remain over the CMO’s ability to drive the organisation forward. Solution: CMOs need to position themselves at the centre of the business both on a perceptual and practical level. As successful as a CMO might be at brand building and consumer connection, their reputation as marketing specialists can pigeon hole them as the folk that simply take care of the peripheral stuff that’s not really core to the business. According to Kate Sayre, Partner at Boston Consulting Group, “CMOs focus too much on the creative itself as opposed to what’s driving the business”. However, good CEOs need to know their customers inside and out – so who better placed than the CMO to take on the role? In addition, the best CMOs know the importance of driving the internal culture of the company, the importance of employees living and breathing the brand with enthusiasm and morale. As drivers of the internal brand and messaging, CMOs know exactly what to do to cultivate a core culture that will ultimately attract more customers. Our advice, spend time educating the business as to why the customer should always be at the heart of everything your business does – and chances are the rest of the board will start taking note. Solution: Where the CEO goes, the CMO should follow. Traditionally CMOs have been left to focus on the marketing and brand orientation side of the business while the CEO has been left to deliver top-line growth and plot the long-term path of the organisation. But in an age where the delineation of roles is becoming more blurred it’s crucial that the CMO and the CEO have common strategic visions. The CMO has to be able to deliver a marketing plan that is as commercially aware as it is creatively sound. Ultimately the CMO must become a lynchpin of the executive team – in doing so, the step to CEO will only be a small one. As Andrew Hayes, CEO and CMO recruiter with Russell Reynolds Associates comments, “More and more, we are seeing clients look to CMOs to be thought leaders for the corporation, providing a broad-based commercial perspective on the business as opposed to narrow brand-building mindset”. Knowledge is power – a progressive CMO who can position the business at the forefront strategically, will gain the ear of the CEO – and hopefully their seat at the boardroom table one day soon. Sticking point 4: Having a one-dimensional view of the company’s finances. Solution: Gaining as much financial experience as possible is a must. CMOs cannot wince at the idea of working with numbers. They must take on the ‘big 3’ of financial documents – balance sheets, income and cash-flow statements (and the associated pressures) and confidently interpret the data before developing plans to drive the business forward. CMOs aren’t number newbies, they measure the results of their ‘creativity’. All CMOs begin with a budget and clear KPIs in mind and understand the importance of calculating ROIs when evaluating the overall success. “Marketing fights an endless battle for investment with lines of business that question the actual value of the marketing spend. CMOs that can justify the expense by demonstrating how technology delivers on success metrics like acquisition, retention, and cross-selling can increase their chances for success,” argues Steve Muran, director of management consultancy ARRYVE. By doing so, you can give your CFO a run for their money – and who knows, even derail their owYour Linkn succession plans. The bottom line: We are in the era of the ‘Eclectic CEO’. According to a recent Forbes article, CEOs now come from a plethora of backgrounds, from finance to technology. CMOs are undoubtedly great communicators, with track records of nurturing strong relationships with their teams and clients. They are astute leaders and know how to market themselves. Ultimately a CMO is at a distinct competitive advantage in their own right in claiming that seat at the top. They simply need to step back, look at the organisation as a whole and apply the same principles that have taken them this far on a wider scale. Agree or disagree? Let the discussion start here. As November creeps around the corner the marketing world goes into overdrive before Christmas. In the mean time we have taken a tour around the best blogs and distilled all the insight you need into one little blog. This is the week that was. The essence of your brand is pretty simple – it encapsulates exactly what your business is about. Your brand is your personality and how you talk to your customers. But how can you be sure that how you are presenting yourself resonates with what your customers and potential customers want and need? This week McKinsey released a fascinating report looking into the characteristics B2B customers are really looking for vs. the ones companies are most often portraying. It seems most organisations seem to be missing the mark. Out of those surveyed none focused on what the majority of customers wanted to see – honest and open dialogue with customers and society. Equally worryingly CSR is the most popular brand characteristic to portray, and the findings show no one relates this with the strength of the brand. This report is a must read and will make you think about how your brand characteristics help you resonate with your customers. Email marketing has taken a bit of a kicking over the last couple of years. An endless queue of marketing experts have lined up to declare its death at the hands of the great social media revolution. We’ve never really jumped on the same bandwagon – no channel is dead as long as you are pushing the right message, at the right time to the right people. UberFlip doesn’t seem to agree either – and this week treated us to a great infographic about where email marketing for B2B is heading next year. Things are looking up – mobile, big data, automation and personalisation will all have a positive effect on the highly criticised channel. What’s your view on where email is going? One thorn in any social media manager’s side is the seemingly constantly changing design options for each channel – and the frustrating restrictions with each one. When you do get creative, however, you can really stand out from the crowd. This week we found 12 of the best examples of YouTube pages that brands use. This isn’t just about listing videos – it’s getting users to interact with your content and to drive social action. Particular favourites are Listerine and Rolex. There is an interesting mentality within many marketing departments where if you are not fitting in with the rest of the market, then you are doing something wrong. This leaves us with industries made up of businesses who are saying the same things, to exactly the same people. It seems mad doesn’t it? This week Dave Trott wrote a great piece about turning your differences, what may seem like a disadvantage, into an advantage. Using the analogy of one of Brazil’s greatest (and least well known) footballers – he gives the example of VW and AVIS who did just this – with remarkable effect. Time to stop being the sheep. Since launching Marketing Cloud, Adobe has produced some brilliant viral videos to promote the product. It does the job well – encapsulating some of the ‘weaknesses’ marketing departments seem to have in properly measuring their ROI. The company’s most recent effort – ‘click, baby, click’ – exaggerates the dangers of measuring the wrong metrics in your marketing. Hits the nail on the head and gives you a bit of a chuckle at the same time. Brilliant. Responsive design. It’s the talk of the town. With people using so many different devices to come to your website it is essential the experience is optimised to that particular screen size. This really simple website that we came across this week explains responsive design clearly and succintly. The perfect example of ‘keep it simple stupid’. From office moves, to marketing automation implementation to furious pitching – it’s been a busy old week at Earnest towers. As always we have kept precious time aside each day to keep up with the all the best news and wrapped it all up in a package that is this, the week that was. Dave Trott has a great philosophy that all agencies should follow when they receive a brief – ‘when faced with a problem, go upstream and challenge the context’. When Leo Burnett were tasked to run a campaign to save the Troy Public Library they had to do just that. Their response was a brilliantly thought out social campaign – taking advantage of what behavioural economist called loss aversion theory. What resulted was a u-turn in public thinking (and a few Cannes Lions to suit). An Earnest favourite. It’s quite amazing the number of bloggers who are so keen to announce the death of (or gallantly support) various marketing channels. It seems we have an obsession creating a competition between the old and new tactics available in the b2b arsenal. Still, all in the name of testing. Forbes stuck on trend this week as they stood up for good old email marketing – explaining why it is more effective than the ever popular social media – arguing customers who come through email are ultimately more valuable. It’s a good case that is made. Our view? It’s all about having the right mix of channels that work together – but test and learn as you go and don’t be afraid to turn that tap off on those that simply aren’t working. We sometimes don our armour and take a stroll into the world of B2C marketing and this week we are glad we did. We came across these fantastic new ads for Jack and Jones featuring esteemed Hollywood actor Christopher Walken. Clear message, striking, engaging and something you want to hit the share button on straight away – these ads do exactly what they should for a little known brand intent on growing it’s share of voice in the marketing. Very cool – enjoy. Here’s the problem. We’re sick to the back teeth of business jargon. So here at Earnest – we think enough is enough and we want to bring the rest of the marketing world with us. Forever realists, we know we’re never going to purge the business world of its lingua franca, but what we can do is take a very large proverbial stick and poke fun at it. We have kicked off in two ways – first a blog post about the dangers of jargon in your business communications and secondly by launching the Alt.Dictionary for business. But we need you to get involved so take a look and share your own (there might even be a tea-towel in it for you). This week we took a trip down memory lane and browsed some of our earliest tweets. Among them was this lovely set of illustrations showing the 8 ways a good idea is killed. Still very relevant 4 years on. 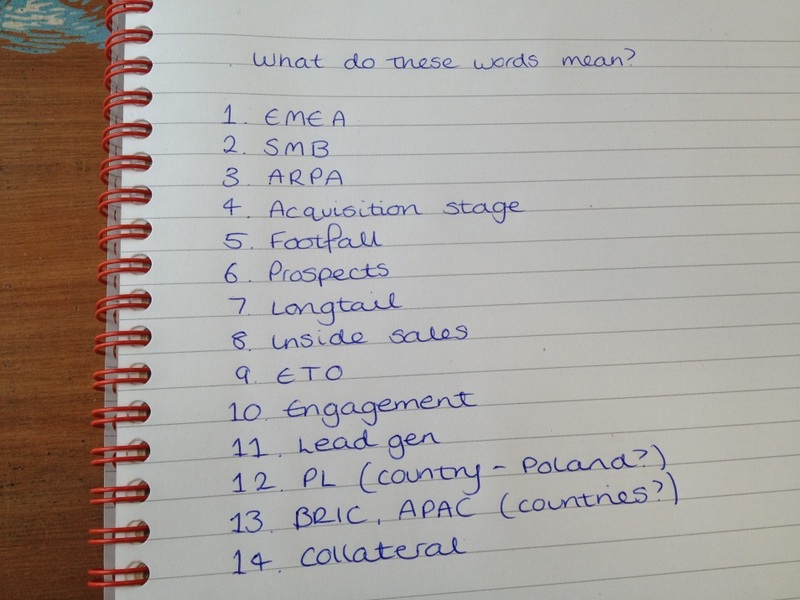 Business jargon – we’re sick to the back teeth of it. So here at Earnest – we think enough is enough. Forever realists, we know we’re never going to purge the business world of its lingua franca, but what we can do is take a very large proverbial stick and poke fun at it. Inspired by I’m Sorry I Haven’t a Clue’s ‘Uxbridge English Dictionary’ the time has come to create our very own definitions of those business and marketing terms that have crept their way into our vocabulary. Below is our starter for 10 so you get the hang of it. But come on, we need your help. Throw what you’ve got at us for the good of our sanity using #nomorejargon or commenting below. We may even liberate a few ‘Vital Statistics for B2B Marketers’ limited edition infographic tea-towels (only one shed’s worth left) and send them to the best contributors. Condillac’s theory was that specialists communicate with their peers in a distinct language – such as by using abbreviations, acronyms and jargon – to maintain brevity and precision, and to be easily understood. We recently had a student on work experience in our Planning team here at Earnest HQ. In between making us all feel quite ancient, we asked her for some thoughts on a live brief we had on for a global lead generation programme. The word ‘jargon’ comes from the Old French word jargon meaning “chatter of birds” – and if we’re not careful, that’s all our marketing communications could turn into. According to e-consultancy, user experience research shows that too much jargon will in fact put off your site visitors. Investors and financial analysts’ experiences were tested on IR pages on corporate websites. One user was “offended by irrelevant information” and “the usual marketing junk and jargon” they saw on a site. Like most users, they expected to find relevant organisation information right away. Successful, engaging sites used bold headings and concise paragraphs to keep users’ attention. 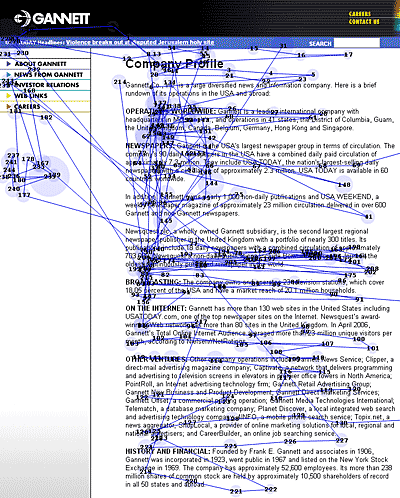 The eye-tracking chart below – with blue dots indicating where users are fixating – demonstrates how users strayed away when it came to longer paragraphs littered with links and sales information. Journalists were also tested, and as you might expect they were an even harder audience to please. According to the report, journalists “typically scanned past lines of text that seemed too marketing-oriented. They were always wary (and sometimes cynical) about marketing information”. Instead, what they wanted were facts and compelling information, presented in a way that they could then easily re-purpose. Eye-tracking research shows that users’ eyes are attracted by numbers in web content. Numbers typically represent facts, and our B2B audience love facts. So this tends to keep their attention and increase sharing. Marketing waffle could have an even more disastrous impact in the financial world. Mortgage lenders potentially face millions of pounds of write-offs by including too much jargon in their comms. According to Professor Daniel Read, a behavioural economics expert, marketing spiel from lenders instils “excessive irrational optimism” in buy-to-let customers. Very much like a library book fine that steadily increases over weeks and months, without us worrying, so can borrowers’ loans if they are not communicated to effectively. Read says that communications must be “personalised and very simple… with no waffle or qualification if it is to be effective”. The Nobel Prize winning economist Daniel Kahneman cites a cognitive study in his excellent book ‘Thinking, Fast and Slow’. The wonderfully titled “Consequences of Erudite Vernacular Utilized Irrespective of Necessity: Problems with Using Long Words Needlessly” includes a number of experiments with Princeton students testing the effectiveness of long and complex words. It demonstrates that the less you force people to think, the more they’ll believe what you’re saying. The paper concludes with the mantra: “Write clearly and simply if you can, and you’ll be more likely to be thought of as intelligent.” Can’t. Argue. With. That. Think with the customer in mind – are you giving them what they want? Read it aloud – does it sound natural? Is this a person talking or a company? Do a ‘jargon-count’ before publishing or hitting send – will all of your readers understand every acronym?